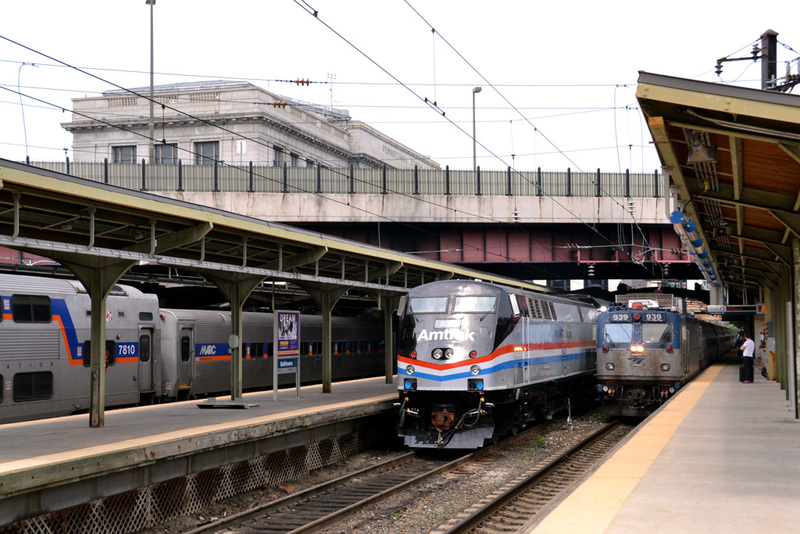 Moving up the Northeast Corridor, the next stop was Baltimore's Penn Station on Preakness weekend. Exhibit Train at Baltimore The Exhibit Train visit to Baltimore felt quiet next to National Train Day at Union Station, but Baltimore’s station has its own charms. This Beaux Arts classical building’s high ceilings and creamy stone and tile interiors and golden woodwork felt spacious and peaceful. The Exhibit Train was right underneath the gates, which sit over the train shed. Stairs or elevator down put one on platform 5, with the parked Maryland Area Regional Commuter (MARC) trains nearby and the Acela and other trains gliding in and out frequently with their normal weekend business. Being Preakness weekend at Pimlico in Baltimore, several parties of race-goers and tourists came up on the Northeast Regional from Washington with me. at Chuggington Depot Chuggington Depot, the themed children’s play area, provided a pleasant area near the Customer Service and baggage check office for children to color and play with the wooden train sets while parents could sit nearby on the historic but comfortable oak benches and relax for a moment while waiting for their train. We also had Operation Lifesaver, NARP and the Reginald Lewis African American Museum there distributing brochures, information and talking to folks. Most of the visitors to the Exhibit Train during my shift were people waiting to catch trains, although we certainly had some die-hard railfans. This time, I worked in the 1980s car, the one in the middle, which has two particularly fun features: a real engineer’s station—not functional, but you can still work the knobs and switches on this massive steel console—and a display of four actual metal train horns—which looked like the brass section of an orchestra (or is that aluminum? )—with both interpretive panels and four recordings of real trains that were hauntingly evocative of quiet country nights and long journeys. Operation Lifesaver's display table One particular group of men was very seriously and quietly studying all the cases, not wanting to ask questions, so I decided to have some fun. When they came into my car, I stepped to the horn display just where they could see me and then pressed the first red button to get the recording to play. The horn sounded its siren call, and I stepped away toward the front of the car without saying a word. A moment later, behind my back, all the horns were played, one after another, over and over. When the group finally moved forward to the next car, did they seem a little less serious?